Nicole was proud to share her Cuban background and heritage, and was honored to receive this summer internship. She has a masters in mathematics and wants to influence the lives of others through teaching general science education. She wants to be a mentor to students who feel they may not be college material, and encourage them to both apply and stay enrolled. Her research interests are in looking at open-ended questions, looking at researching ways to utilize them in chemistry in a positive way. Working with Dr. Scott Franklin on what types of things shape one's identity and whether individuals see themselves as a physics student or professional, she learned the importance of this in terms of retention of physics students. She had felt racism toward Hispanics throughout her life, which kept her, as she put it "in a shell" until 7th grade. She wants to make sure other students don't experience those negative limitations in STEM education. An incoming senior, Ben has a double major in physics and psychology. His work with Dr. Scott Franklin is aligned with his interests—focusing on problem solving physical problems. By watching videos of students in IMPRESS doing tree walk-about and estimating how much carbon is stored on RIT's campus int he trees, he was able to glean their views on the nature of science, looking at how people think of science as a way of knowing, and how it guides them toward expert or accurate science concepts. Ben is also a member of PEER, which Rochester started as the IMPRESS Education Research Squad for undergraduates. Working with both Dr. Franklin and Dr. Ely Sayre, Ben the collaborative students meet bi-weekly on research through ZOOM or Skype. This past summer Ben worked on measuring equity of small groups by quantitatively speaking time as a metric and qualitatively by content and effects they have on the group. An incoming junior, Alexandria is a math major witha computer science minor. She wants to be a math educator. Working with Dr. Kelly Martin, she is working on 2 projects: a design project - model to help undergrad math students communicate effective visual communication and analogies of different design principles (for example, editing and going back and checking one's work; repetition, etc.) Once she returns to CA, she will present her research in a fall showcase. Alexandria will publish a paper on the work she has done with Dr. Martin. Felicia is majoring in Physics, with an option of Biology. Her work with coding schemes looked at different types and usages of arrows. She enjoyed her experience at RIT. Working with Dr. Scott Franklin, she appreciated his approach, as she shared that she had been gently pushed in a different direction in research which shifted her to understanding new concepts. A rising junior, majoring in biology with a minor in education, Grace has done research back at her home institution. Her work has been in helping transition students from their high school sciences into college level and preparing them for doing research—surviving Intro to Biology course seminar and navigating the department. Working this summer with Dr. Kate Wright and Dr. Dina Newman, her research was in the framework of the DN Triangle, obtaining a full understanding of meiosis, and then applying this framework to textbook figures. The research looked at whether students see the textbook figures reflecting all components, including the sides and corners. Part of the research involved speaking with high school teachers to see what knowledge incoming undergrads are obtaining—and which components are missing to see if the two are aligned. This was Grace's first time ont he East coast and enjoyed experiencing RIT and the social aspects of getting to know the other REUs. Kaitlyn is a rising senior majoring in biology and interested in teaching higih school. Working with Dr. Kate Wright and Dr. Dina Newman, she was engaged in two projects during this summer. The first was coding data collected the previous semester to look at understanding and misconceptions in conventional common teaching practices. Secondly, Kaitlyn, working with another REU student, looked at how students interpret diagrams. Taking biology and design principles (good images, fonts) to see what how they were interpreted, how they may need to be changed to make them most impactful. She looked at DNA, captions under 150 words, etc. She appreciated developing the coding scheme, getting direction from her mentors, yet not the answers. She strongly feels it is better to have someone teach you how to get to the answer, rather than feeding you the answer. She says she likes asking questions and that will not stop when she leaves RIT. She now has tools to do so effectively. An incoming senior, Jessica is majoring in Mathematics. Her RIT research work with Dr. Benjamin Zwickl as her mentor, was working with perceptions and attitudes of individuals working in the optics field. She looked at how they interpret the use of m ath in their job, and whether they find it easy or difficult, useful or not. This was her first time flying, and she says it was well worth it, as the RIT REU experience has been great. Having spent half of his life in Pakistan, and the other half in the United States, he is focused on understanding people, the way they think, learn and interpret. Working with both Dr. Dina Newman and Dr. Kate Wright, Muhammad worked on the DNA triangle, looking to see if there are missing representations in each corner of the textbook meiosis images. He shared that he learned so much while at RIT and loved spending time in Global Vilage. In his senior year he is majoring in Biomedical Sciences with a secondary degree in Education. An incoming senior, Danny is a biology major with four minors: chemistry, Spanish, international studies, and STEM education. He will have a Class B high school teaching certification. As a first generation American and first generation college student, he is interested in becoming a high school science teacher. At home he did preventitive cancer research and psychology research with social skills intervention for autistic high school kids. He commented that we all have alot to learn from them. Working this summer with Dr. Kate Wright and Dr. Dina Newman, his focus was on molecular biology research with a concentration on the use of arrows in diagrams and whether there was clarity. Color schemes, stylistic arrow depictions, font combinations, captions and encorporated design principles affect the ease or complexity of understanding. Danny thoroughly enjoyed his fist REU experience at RIT and loved the Red Barn climbing! Majoring in Mathematics/Secondary Education, Abby is a rising senior. She is interested in STEM education, DBER research, math education and student learning, attititudes adn perceptions toward K-12 or higher ed. Working with Dr. Ben Zwickl, and postdoctoral researcher Dr. Anne Leak, her focus was on informing educators as to how well we are preparing students for the workforce. She felt the research she was doing would be helpful to share, as up until this summer she had only been aware of quantitative research and not qualitative research. Aside from the research this summer, she pointed out that the REU program has been tremendous at exposing them to professional development, pathways and future careers. This summer experience has interested her in obtaining a doctorate degree. Fidel worked with mentor, Dr. Christina Goudreau Collison (Chemistry) while an REU at RIT. The work involved reinventing organic chemistry lab instruction by developint a new delivery method for labs to enhance student engagement and more effectively inform the instructors on student cognitive progress. Data is currently being collected at several institutions with varying characteristics (large/small, public/private, 2-year/4-year) in order to evaluate efficacy and transferability. Dr. Goudreau Collison and team are investigating how students learn from these reformed REActivities. Jordan Cardenas, a third year Rochester Institute of Technology student majoring in Biotechnology, continued research he started during the academic year with Dr. Kate Wright and Dr. Dina Newman. Over the summer, as a student in the DBER REU cohort, Jordan investigated how biology textbook authors/illustrators convey scientific concepts through visual representations. More specifically he analyzed all of the different meanings conveyed by arrow representations throughout biology textbooks and determining their effectiveness, or ineffectiveness, in communicating correct ideas to student learners. His mixed-methods approach allowed him to master the qualitative analysis software, NVivo, as well as code visual representations and conduct think-aloud interviews with research subjects. Jordan, from Denver, Colorado, traveled to Minneapolis in July to present his research at the SABER (Society for the Advancement of Biology Education Research) National Conference. His REU experience was very beneficial, and he enjoyed the extra time to work on his project and connect with the other students and mentors. University of Maine senior Brandon Clark worked on two different projects over the summer. The first project was with Dr. Benjamin Zwickl and Dr. Kelly Martin as part of the Photonics and Optics Workforce Education Research (POWER) group. Using a qualitative framework, he coded interviews to better understand entry-level employee, supervisor and hiring manger perceptions of communication. The second project, with Dr. Kelly Martin, involved graphic design principles and visual communication theory. Together they looked at how to improve the visual communication within physics students’ research posters and presentations. Brandon developed guidelines to help students plan and organize the layout of their posters and slides for their presentations so they could effectively communicate research findings. 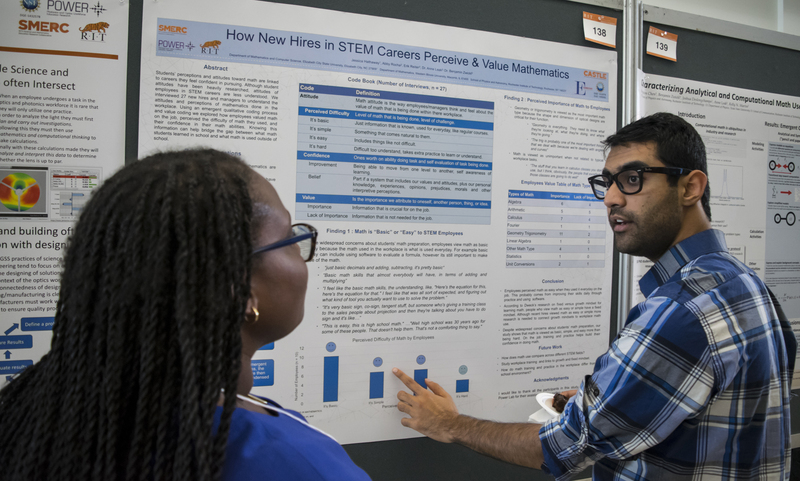 He and Kelly lead one of the REU Professional Development Workshops where they discussed his research on best visual communication practices for STEM students in preparation for the Rochester Institute of Technology Undergraduate Research Symposium in August. When Brandon wasn’t working on his two research projects he was able to explore the Rochester area, traveling to Niagara Falls with the rest of the REU students. He had a great experience over the summer, finding the January Jump-Start essential in preparing for his research projects. This past summer Catherine "Rin" Clasen worked with Dr. Dina Newman and Dr. Kate Wright, as well as fellow DBER REU student Megan Stefovich. Together they looked at the use of 3D models to improve understanding of processes related to the flow of genetic information. Data collection was done through student interviews and analysis of open ended questions. Interview subjects worked through the models and attempted to answer a series of guiding questions that are meant to help students scaffold and apply new knowledge. Video and audio data helped the researchers capture important data on how students are interacting with the models and what gains in understanding are made. Rin, from Chicago, is currently studying Secondary Education at Drake University. After college she hopes to teach biology at the highschool or middle school level. The REU was a great experience for Rin, bringing her to the East Coast for the first time, and she found the weekly workshops to be very valuable. DBER REU student Amanda Matheson, a junior studying Physics at Colorado School of Mines, and Laura Wood, a senior studying Physics and Applied Math at Seattle Pacific University, worked together with Dr. Scott Franklin this summer on student responses to guided reflection forms (GRFs). They used a coding scheme to classify statements and language used in the GRFs and saw how student reflections changed from week to week. They also developed a separate coding scheme for the feedback given by the professor, and analyzed those responses for emergent themes. They also worked with RIT computational linguistic researchers to conduct sentiment analysis on both student and instructor texts, including word counts and affective intent. During their time at RIT Amanda and Laura appreciated the opportunity to collaborate with other research students and receive faculty support through weekly workshops. On the weekends they enjoyed participating in various REU social activities like the trip to Niagara Falls and game nights. Katie Miller, a senior majoring in Chemistry at University of Nebraska-Lincoln, spent the past year conducting research with Dr. Marilyne Stains. They used an observation protocol instrument called COPUS (the Classroom Observation Protocol for Undergraduate STEM) to look at instructor and student learning patterns in the classroom. This past summer, as part of the 2016 DBER REU cohort, Katie worked with Dr. Thomas Kim and they looked at misconceptions students have with visual representations of hydrogen bonding. Katie developed a coding scheme to code student responses in order to determine shortcuts they are using to get to their answers when asked about hydrogen bonding. Another project Katie worked on was using perceptual learning as a framework to understand student misconceptions of chemical resonance when presented with a representation of benzene's two resonance forms. Katie, who also minors in education, physics and mathematics, has plans to get her Masters in Science Education to eventually teach at the high school level. During her time at RIT Katie enjoyed being able to solely focus on research and meeting new people. DBER REU student Katie Palmer currently studies liberal arts education at California State University, Monterey Bay. She got out of her comfort zone over the summer to travel across the country for her first research experience. Katie worked with Dr. Corey Ptak and they looked at the use of debate of complex topics in classrooms to see if it helped students’ progress intellectually and ethically. Using Perry’s Scheme of Development, Katie analyzed words from pre and post-debates of the topic of climate change. She categorized words obtained from data in both non-major biology and majors biology classes to see if there was a shift. Aside from research Katie was able to take advantage of her time in Rochester and went to Niagara Falls, the Rochester Public Market and Marketplace Mall. What she enjoyed most about the experience was the bond she created with her cohort, especially during their weekly Friday night game nights. DBER REU student Brianna Santangelo, from New Jersey, worked with Dr. Ben Zwickl and Dr. Anne Leak this summer. Brianna looked at how math is used in the optics workforce, specifically how it is learned on the job and how it is communicated to peers and customers. With her research she hoped to gain a better understanding of the hidden math skills, which will inform the teaching of mathematics within the physics curriculum so it is more applicable to students’ future careers. Brianna, a senior double majoring in Physics and Secondary Education at The College of New Jersey, has plans to attend Graduate school for Physics Education and teach in the high school or college level. She had a great time with everyone in the DBER REU group and found the workshops held each week very helpful. DBER REU student Megan Stefovich, from the Rochester area, worked with Dr. Dina Newman and Dr. Kate Wright this summer. They looked at the use of 3D models to improve understanding of processes related to the flow of genetic information. Data collection was done through student interviews and analysis of open ended questions. Interview subjects worked through the models and attempted to answer a series of guiding questions that are meant to help students scaffold and apply new knowledge. Video and audio data helped the researchers capture important data on how students interacted with the models and what gains in understanding are made. Megan, a junior double majoring in Biology and Life Sciences Communication at University of Wisconsin-Madison, was excited about a possible side project with RIT-NTID ASL interpreters. The interpreters expressed interest in working with her and Catherine Clasen, another DBER REU student, in developing a workshop for science interpreters to help them better understand and communicate concepts about genetic information flow to Deaf/Hard of Hearing students. Megan has really enjoyed working with her cohort and all the mentors. She appreciated how invested they all are in the research projects. Nicholas Young, from Cleveland, Ohio, worked with Dr. Benjamin Zwickl as part of the Photonics and Optics Workforce Education Research (POWER) group this summer doing optics and photonics workforce research. Nicholas analyzed data about key job skills based on interviews with local employers, employees and graduate students. He specifically looked at the use of math in the workplace in terms of what topics are most important, what math tools are used, and how that varies between technicians, engineers, and graduate students. Nicholas, a senior at Ohio State University majoring in Physics and Astronomy, plans to enroll in Graduate school for Physics Education Research. He appreciated working with the REU group this summer as they shared the same interest in DBER (discipline-based education research). Charles Bertram, a 5th year Physics major studying at University of Central Arkansas, has been conducting physics education research for the past two years. This past summer, as a student in the DBER REU cohort, he was working with Dr. Scott Franklin to study how deaf/hard-of-hearing and first-generation students can use metacognition to assist in the transition of going from a novice to an expert. Charles, who grew up in West Palm Beach and wants to teach post-college, has loved the opportunity to travel access the country to gain research experience. In addition, the DBER REU workshops he participated in while at RIT proved to be very beneficial. DBER REU student Eli Church, an Amherst, Massachusetts native, worked on physics education research this past summer with Dr. Scott Franklin. She looked at how Physics professors present math in the contexts of physics classrooms – for example, when a professor writes an equation, how do they embed physical meaning or make explicit problem solving strategies. Eli has previously studied physics education research at Texas State University in San Marcos, Texas. Other research interests include gravitational wave and optics. DBER REU student Kayla DeOca, from Port Tobacco, Maryland, worked on a biology educational project this past summer with Dr. Dina Newman and Dr. Kate Wright. She conducted faculty interviews, reviewed textbooks and looked at student artifacts to gather data about expert and novice conceptions of meiosis. With this data Kayla categorized all the misunderstandings that occur in student learning in order to find a better way to teach the complex subject. Kayla, who attends college at Jacksonville University, has a strong interest in immunology and plans to go to grad school. Teaching at college-level is another interest of hers, one that she hopes to pursue after grad school. Kayla enjoyed spending her weekend’s on-campus as well as exploring the city of Rochester. Joshua Deslongchamps, a 5th year Texas State University student double majoring in mathematics and physics, has previously conducted research on material science and semiconductors. This past summer, as a student in the DBER REU cohort, he worked with Dr. Benjamin Zwickl and Dr. Kelly Martin. His research project was studying how computational and analytical mathematics skills are developed during undergraduate studies and how those skills are used in entry-level STEM jobs and in PhD research projects. Joshua, who grew up in El Paso, is looking at multiple post-college options which include grad school for radiation therapy and the full-time job market. DBER REU student Zachary Farley, a Chemistry major studying at Kennesaw State University, has been conducting chemistry education research under Dr. Kimberly Linenberger for the past two years. This past summer Zachary and his mentor Dr. Paul Craig worked with software that stimulated protein separation by two dimensional electrophoresis, followed by protein sequencing by tandem mass spectrometery. They focused on designing an assessment tool for teachers to use in the classroom when they use the simulation as a teaching tool. This project allowed him to further explore the technology side of teaching. Zachary, who is from Powder Springs, Georgia, enjoyed his time at RIT. He was able to explore the Rochester area, travel to Niagara Falls and went on a trip to New York City. Chloe House, a senior majoring in Chemistry Education at Kennesaw State University, has spent the past two years conducting biochemistry education research with Dr. Kimberly Linenberger. This past summer, as part of the 2015 DBER REU cohort, Chloe investigated how students interact with an online learning tool, called the Interactive Video Vignette (IVV) for biology. Chloe evaluated the impact of IVVs on learning and helped the research team identify ways in which IVVs fail to be effective tools for biology learning. Chloe truly believes that IVVs are an effective learning tool and can’t wait to see them implemented in universities all over the country During her time at RIT Chloe enjoyed working with all the RIT mentors and students in the program. On the weekends she was able to experience many local activities include the Xerox International Jazz Festival. Orange County native Phyllis Liang worked with Dr. Newman and Dr. Kate Wright this past summer on a Biology Education Research project investing how scientific concepts and processes are depicted in biology textbooks. Phyllis was especially interested in how arrow symbols are used throughout textbook images and how they are interpreted, or misinterpreted, by students. Her work is important because it will help inform an improved scheme for arrow representation. Phyllis, a Cal State Fullerton senior majoring in Biology with a concentration in Ecology, enjoyed her experience with the DBER REU. She was able to make wonderful connections with other students and faculty mentors. When Phyllis wasn't working on her research project she was able to explore the Rochester area, as well as Niagara Falls with the DBER REU cohort and took a trip to New York City. DBER REU student Alex Rhoades, from Carroll County, Maryland, worked with Dr. Tom Kim and Dr. Kelly Martin this past summer. He applied cognitive load theory to pictures in general chemistry textbooks to find common and consistent areas in which they create extraneous cognitive load. This “makes it difficult for students to learn because more of their brain’s active processing power is being used up by design flaws”. The goal was to create criteria that can be used to revise images, leading to enhanced student performance. Alex, who majors in Chemistry and English at St. Mary’s College of Maryland, will be pursuing a career as a Chemistry Professor. He enjoyed rock climbing at the Red Barn and trying out local restaurants, including Sticky Lips, while at RIT. DBER REU student Ivy Todd, a Bowie, Maryland native, worked with Dr. Tom Kim this summer. Together they developed a rubric to assess figures used in chemistry textbooks on the basis of the extraneous cognitive load imposed on students. Ivy determined which features of the images make interpretation complicated for students. The goal of her research was to create criteria that can be used to revise images, leading to enhanced student performance. As a student at St. Mary's College of Maryland, Ivy’s research interests include chemistry education and organic synthesis. She wants to continue undergraduate research at St. Mary’s and expressed interest in continuing on in that field after graduation. While at RIT Ivy had fun exploring the Rochester area. Centerville, NY native Jarrett Vosburg worked with Dr. Benjamin Zwickl and the Photonics and Optics Workforce Education Research (POWER) group this past summer doing optics and photonics workforce research. Jarrett studied problem solving skills used by graduate students in the physical sciences and engineering. He interviewed graduate students, categorizing the types of problems they encounter while conducting PhD-level research and looked at how it matches up with the undergraduate curriculum. By understanding the types and ways graduate students solve problems, his hopes were to to influence the undergraduate curriculum in order to better prepare students for the workforce or graduate research. Jarrett, a SUNY Geneseo senior Physics major, with certification in Physics Education and General Science, has interest in teaching at the high-school level after graduation. He appreciated working with the DBER REU group this past summer as he’s was able to gain insight into the teaching field.